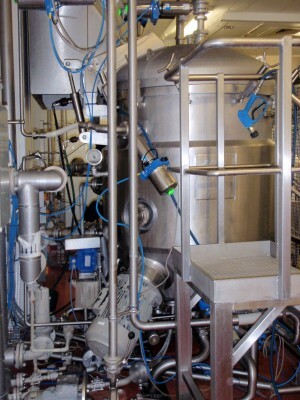 Greencore Chilled Sauces and Soups has invested in cooking and filling equipment from TLV Euro Engineering to increase production capacity and output at its Bristol site. Greencore produces a range of own-branded cooking sauces and fresh soups for supermarket customers such as Asda, Co-op and Sainsbury's. More recently, the focus of the Greencore engineering team has been to increase the efficiency of the 10 cooking vessels at the site. When the vessels were first installed they were fitted with standard TLV pilot valves, which, from a cold start, provided 1.5 bar of steam pressure in the jacket for the initial stages of cook. However, we realised that in order to increase the productivity of the process we needed to increase the efficiency of the heat transfer, and TLV suggested fitting its CV-COS electro-pneumatic control valve, which combines a convenient control function with a separator and steam trap in one compact unit. The new valve, which is designed for process applications requiring automatic control of the pressure, temperature and the flow rate of steam, maintains a constant pressure in the jacket from start-up. Besides improving heat transfer - and therefore efficiency and productivity - the CV-COS is also said to provide Greencore with the ability to easily change pressure in order to cook different sauces. In addition, having an integral separator and steam trap means that the CV-COS provides consistently good steam quality at point-of-use, which also contributes to the efficiency of the production process. Wills said the CV-COS installation was scheduled for the weekend to avoid process downtime, but when the unit itself arrived it had been damaged in transit.